Four llama antibodies and a harmless virus: This outlandish recipe could be the basis of a nasal spray designed to foil infection from all strains of influenza. The spray, containing a virus engineered to make a protein derived from the llama antibodies, has passed its first animal test, protecting mice from every known flu strain that infects humans, a research team reports. Although the strategy must go through more testing before human trials can begin, researchers who have struggled to develop a “universal” vaccine against the highly mutable flu virus say it merits serious attention. The nasal spray could prove a boon to the elderly, who typically suffer most from flu and get only weak protection from existing vaccines. And unlike traditional influenza vaccines, which are tailormade each flu season to match the viruses in circulation, it could be stockpiled as protection against a flu pandemic. “This is a great story and shows the power of antibody engineering,” says immunologist Antonio Lanzavecchia, a leading flu vaccine researcher at the Institute for Research in Biomedicine in Bellinzona, Switzerland. Antibody engineer Joost Kolkman at Janssen Infectious Diseases in Beerse, Belgium, and his colleagues thought an unusual class of antibodies made by llamas and their camel cousins might serve as a weapon against flu. These antibodies are unusually small because they lack the “light” peptide chain that normally bulks up each arm of the Y-shaped proteins. Researchers can further pare down the remaining “heavy” chains to create so-called nanobodies, able to reach into crevices of viruses that their full-size counterparts can’t touch. To create nanobodies against the flu, the Janssen group injected llamas with a vaccine containing three different influenza viruses, as well as the viral surface protein, hemagglutinin, from two other flu strains. They then harvested four antibodies that each neutralized many flu strains. Ultimately, the team was able to engineer a gene that expressed a protein made up of nanobodies derived from all four antibodies. “It’s very easy to link the domains together into one single molecule,” Kolkman says. They spliced the gene into a benign adenovirus-associated virus (AAV) that’s used in gene therapy experiments. A flu-fighting antibody targets four sites (colored areas) on the virus’s hemagglutinin surface protein. 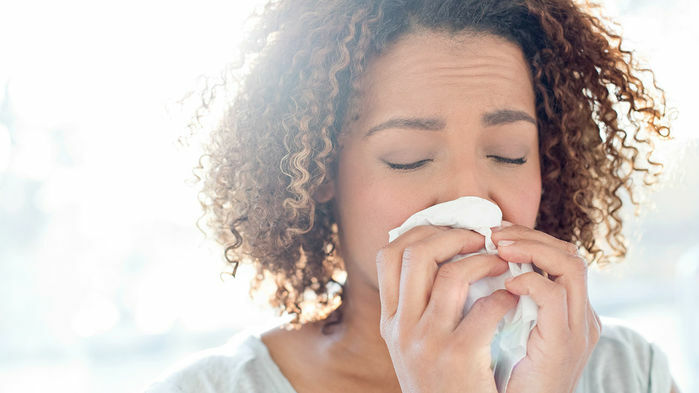 Test tube studies showed the four-in-one antibody prevented infection by 60 different influenza viruses from both the type A and B groups that infect people. “It’s been quite hard to find an antibody that neutralizes both A and B,” says Ian Wilson, a structural biologist at the Scripps Research Institute in San Diego, California, who helped work out how the nanobodies bound to the virus. Mice given the synthetic antibody—delivered either by squirting the doctored virus into their noses of the mice or by infusing the protein directly into their circulation—had significantly higher survival rates than untreated rodents when injected with a variety of influenza strains. Wilson, who has published more than 50 papers on influenza antibodies, says he’s never seen one with greater breadth and potency. Because AAVs can persist for months, the strategy could offer extended production. “Hopefully it would last the entire flu season in humans,” Wilson says. Immunologist James Crowe, an influenza antibody specialist and vaccine developer at Vanderbilt University in Nashville, cautions that human immune systems may see the llama-derived proteins as foreign and develop antibodies against them. He also notes that although AAV-based treatments are being tested for life-threatening diseases, giving the virus as a flu preventive would face more intense scrutiny from regulators. “The bar for putting AAV in a healthy individual is going to be very high,” Crowe says. Previous Post Are wild monkeys becoming a reservoir for Zika virus in the Americas? Next Post Ethics aside, does the CRISPR baby experiment make scientific sense?